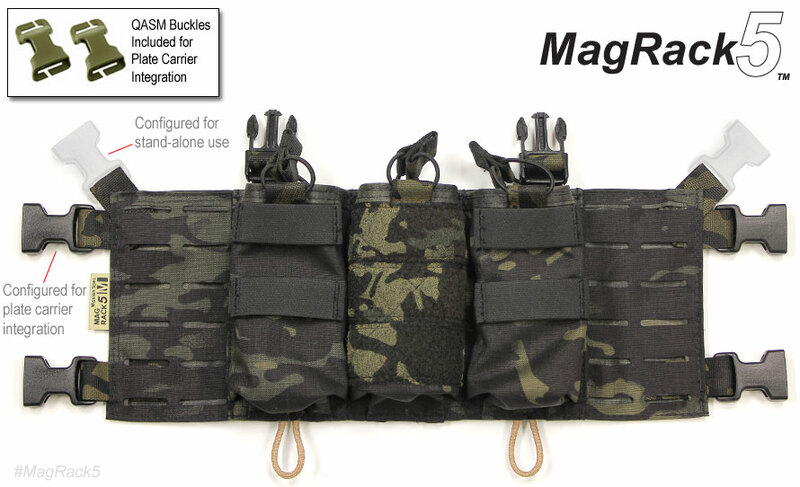 The MagRack5 is light-weight magazine carrying solution. 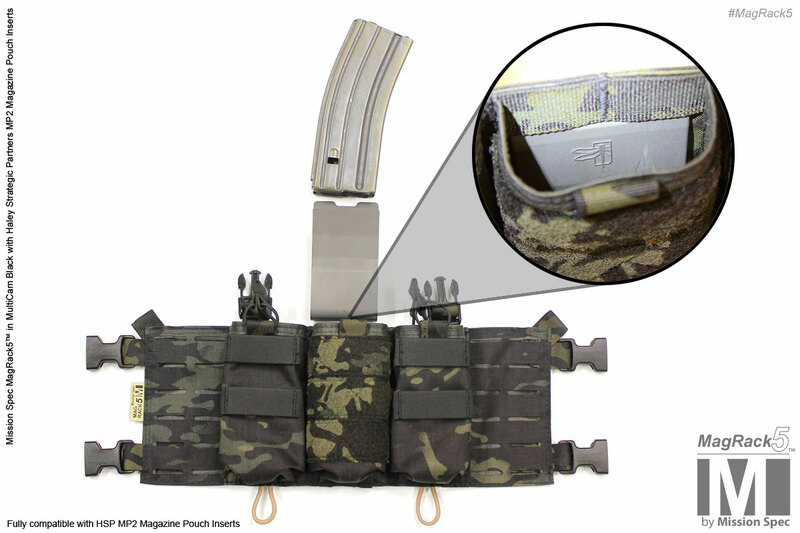 3 STANAG type magazines (5.56mm) can be carried in the 3 center pouches. 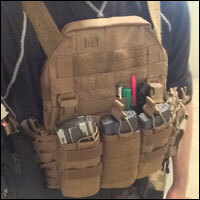 Laser-cut ‘PALS’ areas are located on both the right and left sides for the attachment of additional MOLLE compatible pouches (additional rifle ammo, pistol ammo, IFAK, Radio, etc). 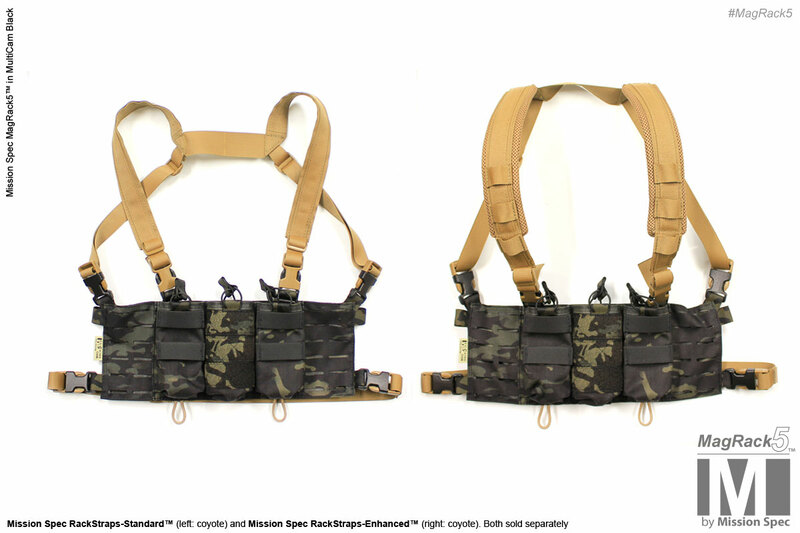 The MagRack5 can be used as a stand-alone ammunition carrier when used with the Mission Spec RackStraps™ (RackStraps-Standard or RakcStraps-Enhanced: more info to right) or integrated into a plate carrier such as the Mission Spec EC2™ or AC2™. 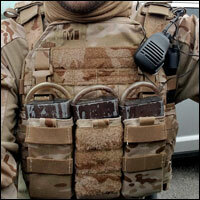 A hook Velcro field (with cover) on the rear of the MagRack5 allows it to ‘stick’ to compatible plate carriers. Don’t see the pattern you want? Ask us. We build custom patterned units. Custom patterns below. Please contact us for details. Don’t see the pattern or color that you need? Let us know. We like a challenge. 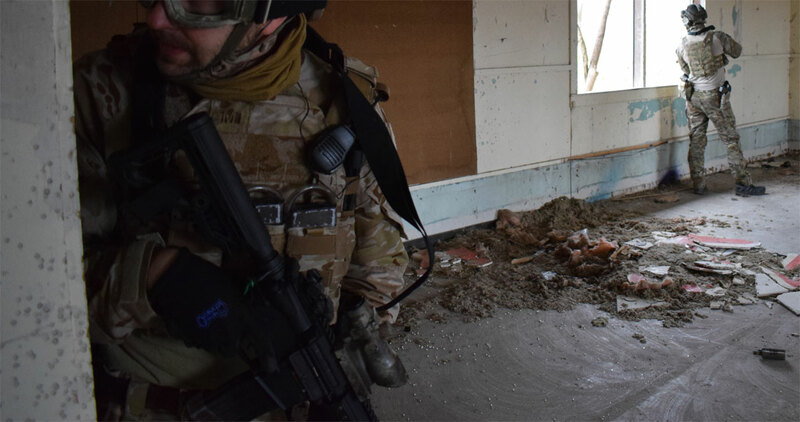 Crye MultiCam, MultiCam Black, MultiCam Tropic, MultiCam Arid, ATACS LE, ATACS AU, ATACS FG, Grey, Olive Drab (OD), AOR2, Black, Coyote Brown, M81 Woodland, Desert Digital (comparable to AOR1 pattern), Ranger Green, Red, Kryptek; Highlander, Typhon, Mandrake. 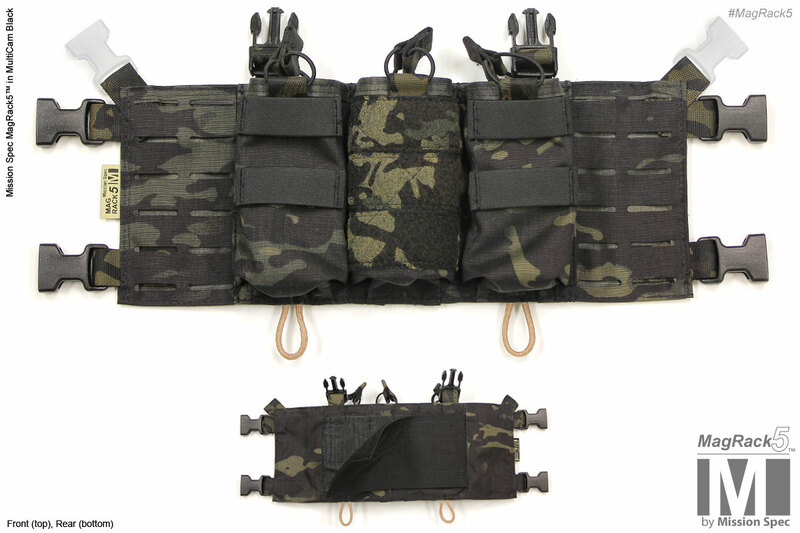 Includes pouches for 3 STANAG 5.56mm type magazines. 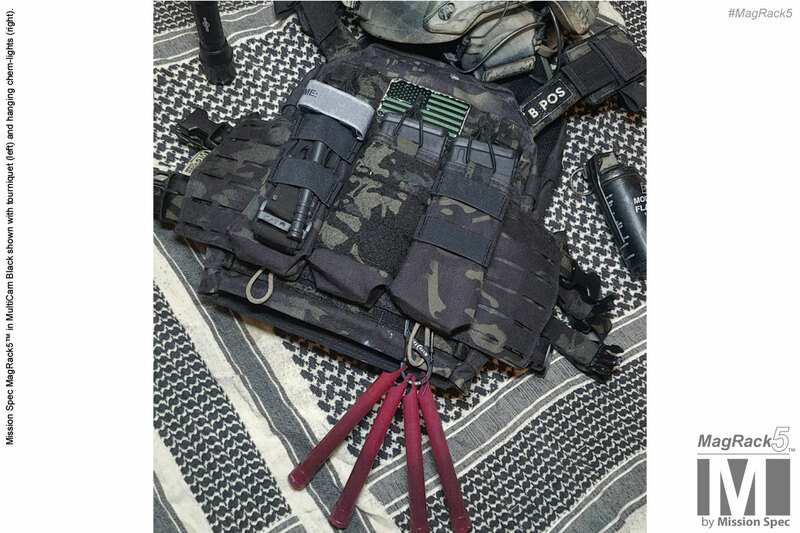 Laser-cut side wings for attaching additional MOLLE compatible pouches. 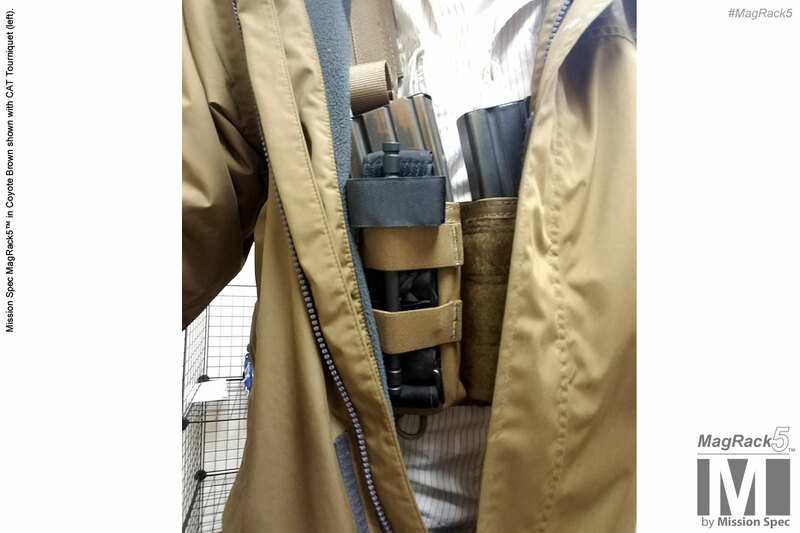 Dual underside 550 cord loops for chem-light storage. 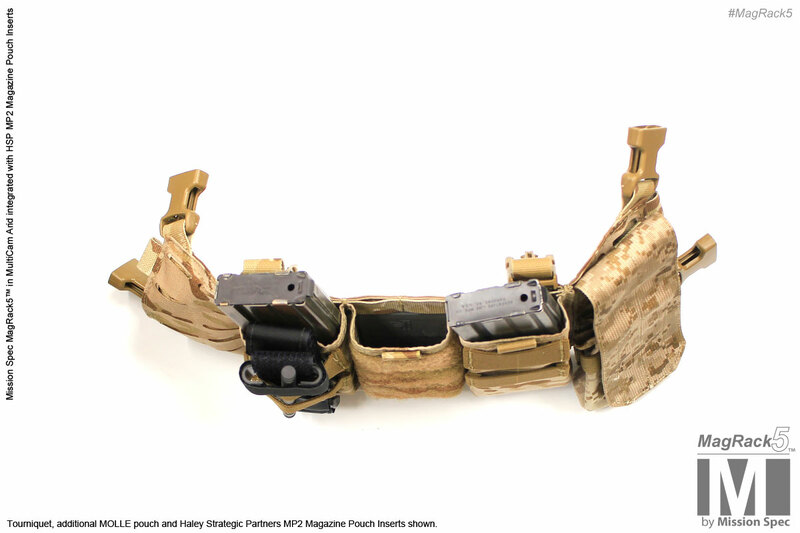 Compatible with HSP MP2 Magazine Inserts. 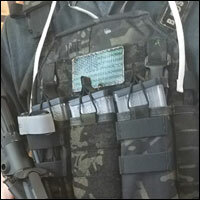 Rear hook Velcro field (with cover) for plate carrier integration. 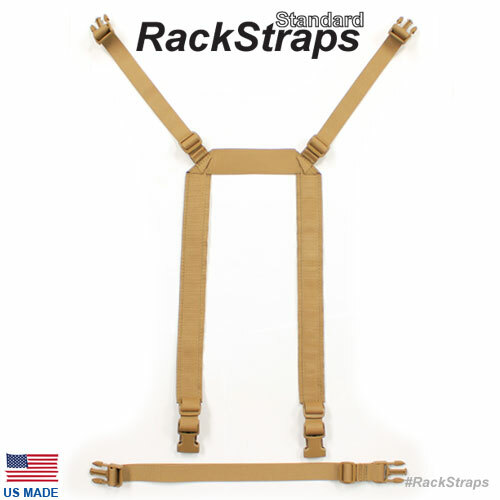 Top horizontal polymer buckles can be attached straight out or at 45-degrees depending on stand-alone or carrier integrated use. 1000D CORDURA®. 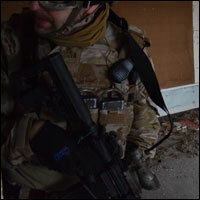 (MultiCam; Arid, Tropic, Black 500D). 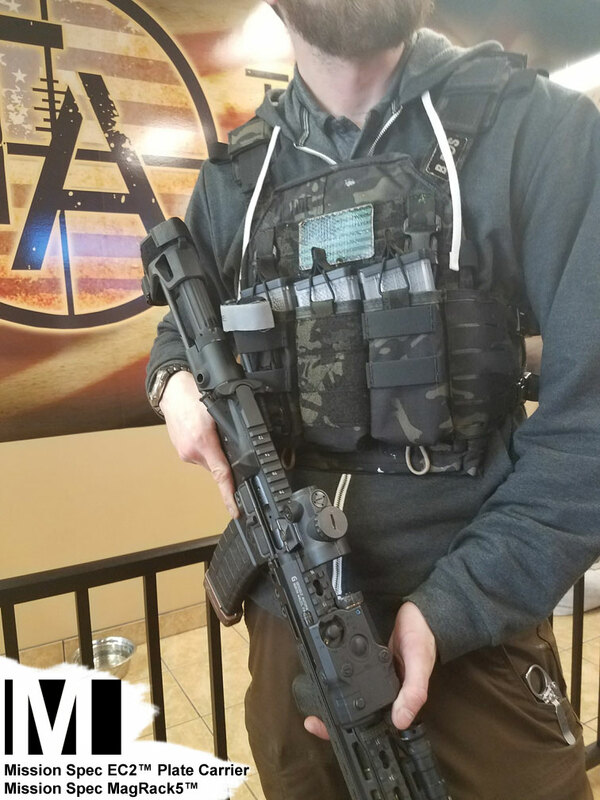 Industry standard ITW buckles used. 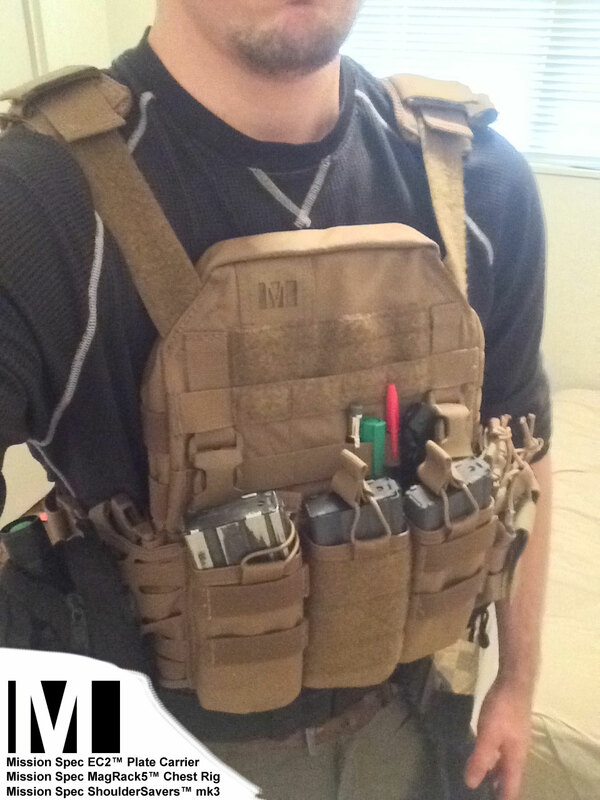 Berry Compliant (see: Berry Amendment USC, Title 10, Section 2533a). 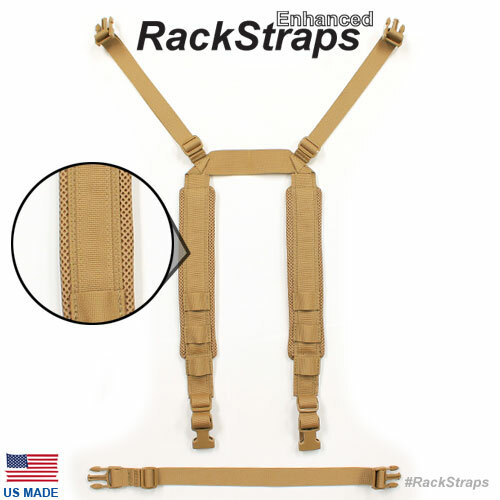 100% U.S.A Designed, Tested and Manufactured. 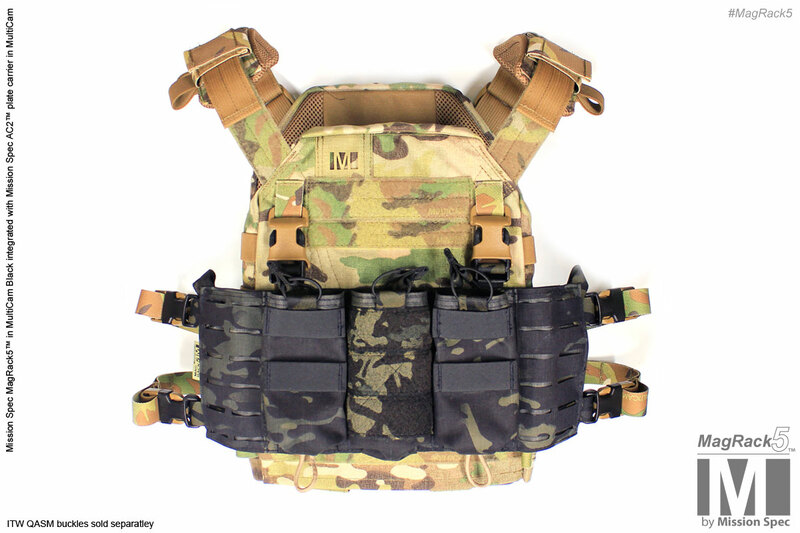 The MagRack5™ in the MultiCam Arid pattern attached to an EC2™ plate carrier. 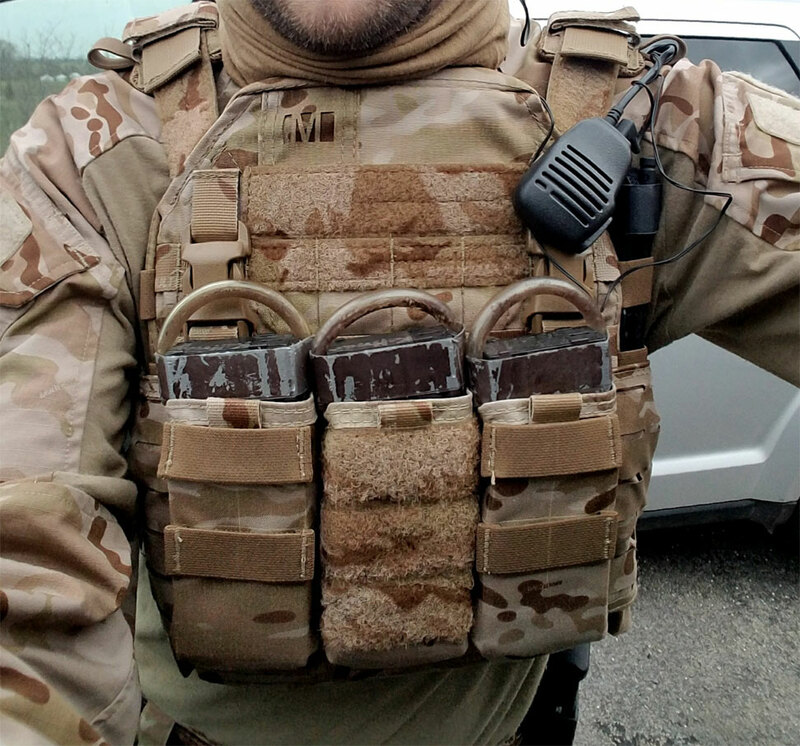 Contractor in South Africa sends this pic of his Mission Spec EC2™ Plate Carrier in Coyote integrated with a Mission Spec MagRack5™ and Mission Spec ShoulderSavers™. 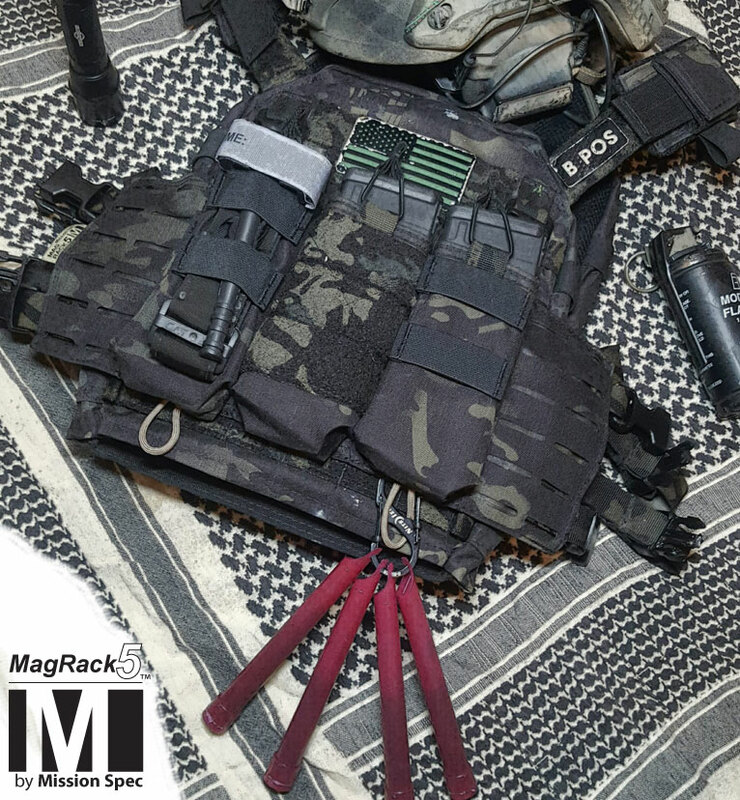 The MagRack5 integrated with a EC2 plate carrier (both in MultiCam Black). 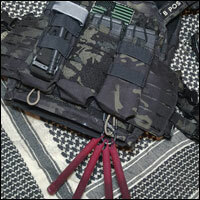 Showing the storage of a tourniquet and utilizing the chem-light hangers. 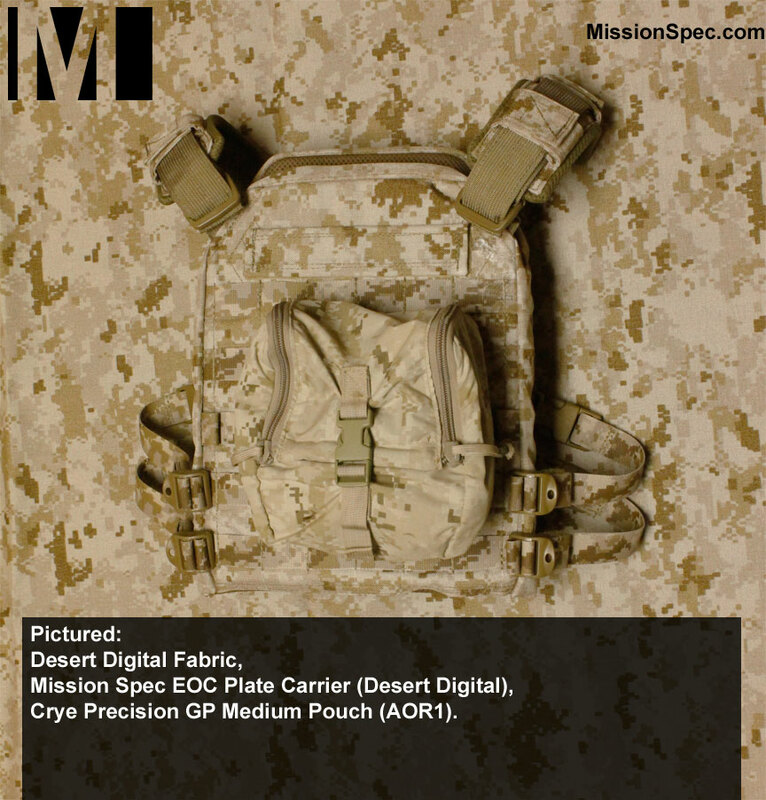 A Mission Spec MagRack5™ in MultiCam Black integrated with a Mission Spec EC2™ Plate Carrier.